It is a collection of textbooks selected for classes offered in workforce programs. These textbooks are purchased by the ACC Student Support Center through a grant to assist certain student groups to gain access to required textbooks. The majority of ACC textbooks ARE NOT in this collection. You cannot request a textbook online or by phone. The best way to request a book is to go in person to the campus library closest to you. Books are in limited supply and students should not depend upon this source for their required textbook. See a list of all titles in ACC's Support Center Textbook Collection. Click on each of the headings listed below to find answers about the textbook collection. Before classes start Only Student Support Center clients in the Early Access Group are eligible. Visit with staff in a Student Support Center BEFORE the semester begins to determine your eligibility. Eligible students will receive information and required forms to begin the process. During the first week of classes Students in any Workforce Program may be eligible. Visit with staff in a Student Support Center BEFORE the semester begins or DURING THE FIRST WEEK OF CLASSES to determine your eligibility. Eligible students will receive information and required forms to begin the process. After the first week of classes All currently enrolled ACC credit students who have no outstanding student holds on their library record are eligible. First come, first served. No, only textbooks purchased by the ACC Student Support Center through a grant to assist certain student groups to gain access to required textbooks are in this collection. You can check the list of textbooks by title yourself in the Library Catalog. See the section below How can I check to see if a textbook is available? for more information. Where can I find out what textbooks I need? BE SURE TO KNOW WHICH TEXTBOOK TO GET. Different sections of the same course may use different textbooks or different editions of textbooks, depending upon what the instructor has selected. The quickest way to find out which textbooks you need is to consult your Online Services pages. Click on a course In the next window, scroll to the bottom and click on "View Books Needed for Course"
Textbook information is available also at the official ACC campus bookstore or from your professor, their syllabus or their website or Blackboard page. See specific shortcuts. Please call or email the Support Centers if you have questions about the textbook collection, your eligibility or any lost or overdue textbooks. You may also visit their home page at (https://www.austincc.edu/students/support-center). Note: There is no Support Center at RGC. The best way to request a textbook is to go in person to the campus library closest to you. During the week before classes and the first week of classes: ONLY eligible students must take the authorization form you receive from the Support Center and an ACC photo ID to any ACC Library. Note: RGC does not have a Support Center, so you must go to any other ACC campus to get an authorization form. After the first week of class: Any currently enrolled ACC credit students who have no outstanding holds on their library record can check out textbooks from the collection with an ACC photo ID. First come, first served. Use the drop down menu in the upper left. Select Textbook Collection. Remember students cannot request a hold for a textbook online or over the phone, all requests for textbooks must be done in person and initiated between library staff. 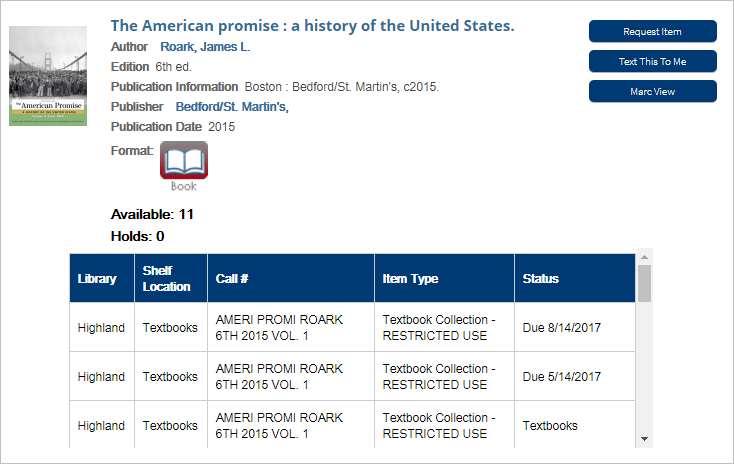 In the example below, the first two copies are part of the Textbook Collection but are checked out. The third copy is available for semester checkout. Can textbooks be sent to my campus or held for me at HLC? You must go to a library in person to request an available textbook during your eligibility period. Students cannot request or reserve a textbook online through their library account or over the phone. However, students should first check the Textbook Collection list (https://library.austincc.edu/eresources/textbooks) to see if the textbook is available. It usually takes three weekdays for a book to arrive at your campus. Or the library staff member can call Highland and the book will be held for you to pick up there. Students may check out up to five textbooks unless otherwise authorized by the Support Center. Textbooks from this collection are due the last day of your classes. All other textbooks which may be on reserve or happen to be in the regular collection have a shorter checkout period. Be sure to note the date due.